about social values, fear, violence and war. 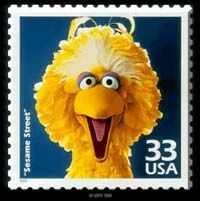 Big Bird's Favorite Song: "The Alphabet"
best friend exists; chicken soup and change. "Sesame Street" debuted on public television November 10, 1969. According to the Children's Television Workshop, "Sesame Street"
an Action for Children's Television Special Achievement Award. the Frog became familiar in every household. ABC-DEF-GHI Big Bird's classic confusion song! ahhh. From "Follow That Bird"
Everyone Makes Mistakes classic and still good advice. Hot, Hot, Hot Elmo's feeling hot, hot, hot! "How Do You Get From Here To There? what do you do?" 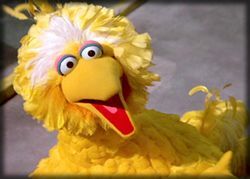 I Just Adore Four Big Bird's ode to the number four. Just One Me Big Bird reminds us how special we are. Macarena even the Street's not safe from this dance craze! One Little Star a classic from the movie "Follow That Bird"
A Very, Very Special Letter a very, very silly song by Big Bird.